Overview of Human Geography: What is Geography? 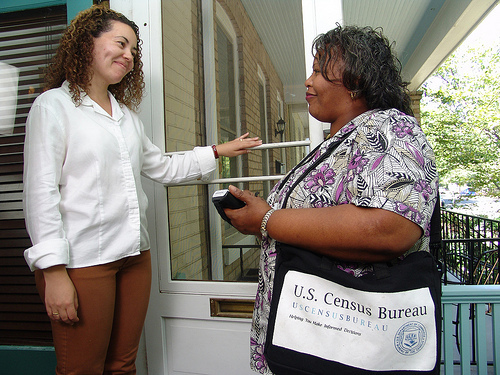 A worker for the 2010 US Census collects some data, which can then be used by human geographers for a variety of purposes. Figure 1: Scale. If we look at average per capita income in the city of Pittsburgh and its surrounding communities (top), we can see a clear pattern of poverty concentrating in the center of the city and in old industrial areas along the Monongahela River, while wealthier people live in the outskirts of the area. When we zoom out to see the whole state of Pennsylvania, we lose much of that detail, but gain a broader perspective. The state-scale map allows us to see that Allegheny County (home to Pittsburgh) is comparatively wealthy overall, with a wide belt of low incomes in the rural center of the state and a concentration of richer population in the southeast around (but not in) the city of Philadelphia. Geographers have expended much effort and angst on defining what the boundaries of our discipline are. One useful definition, proposed by Charles F. Gritzner, is that geography asks "what is where, why there, and why care?" (Gritzner 2002). That is, geography asks "where" questions about any phenomena on our Earth -- from rock formations to cultural traits -- that have a location. The geography you took if you went to elementary school and high school in the United States or a similar country probably focused mostly on the first part of this definition: learning where places are on the Earth. You will be relieved to learn that at the college level, we will not be spending much time memorizing state capitals. Instead, we want to press on to Gritzner's second and third questions. Geographers want to explain why things are found in the places they are, and not somewhere else, and then show why this matters. Because geography can ask "where?" questions of practically any phenomenon, the world of geography overlaps with many other disciplines. Scholars housed in other departments often do work that falls within the scope of geography as defined here. For example, the economist Paul Krugman and the political scientist Cynthia Enloe have been named honorary geographers because their work addresses geographical questions. As you read the chapters of this book, you will find that we frequently draw on non-geographical theories to help us understand the phenomena whose geographical aspects we're interested in. Thus, for example, we need to refer to sociological and psychological theories about what gender is before we can begin to explain the geography of gender. Space: Space refers to the two- or three-dimensional distribution of phenomena over the surface of the Earth. "Spatial" is the adjective referring to things having to do with space -- thus, for example, mapping out where rice is grown would be a spatial analysis. Place: Place refers to the constellation of phenomena that come together at one particular location on the Earth. Geographers are interested in how those different phenomena interact with each other, and how they form the distinctive character of that place. Environment: Environment literally means that which surrounds. Because all of the different phenomena geographers study share the same world, any one thing is going to be surrounded by other things, and that spatial proximity will matter to the thing of interest and/or its surroundings. We commonly use "environment" to refer to the natural environment, that is, those aspects of our surroundings that were not created by humans, but we can also speak of a social environment (the people around us and what they’re doing) or a built environment (buildings, roads, farms, etc.). Scale: Scale refers to the size of the area we're interested in, and the level of detail we're using. Usually these go together, so looking at a broader area means we're seeing less fine detail, and vice-versa. Phenomena will appear differently if we examine them at different scales, so it is always important to consider whether you are thinking about an issue at the appropriate scale. The difference scale makes is illustrated in Figure 1. 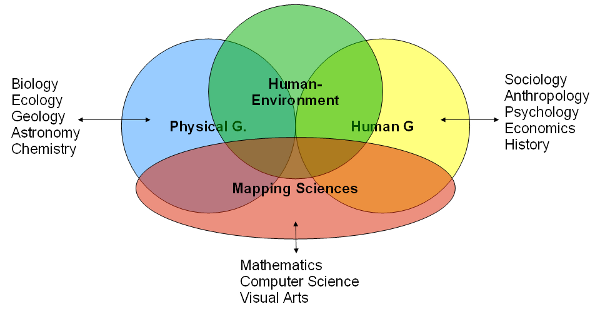 Figure 2: Geography's four fields. Physical Geography: Physical Geography deals with the "where" questions when applied to non-human aspects of our world. Physical geographers may ask why a mountain range formed in a particular place, or how changes in the warmth of the Pacific Ocean affect weather patterns elsewhere in the world. Physical Geography intersects with disciplines such as Geology, Meteorology, Biology, and Ecology. Human Geography: Human Geography asks "where" questions about human phenomena such as population, culture, and political systems. A human geographer may study changes in gender roles among Muslim immigrants to Europe, or how transportation systems affect commute times in several different cities. Human Geography connects with disciplines such as Sociology, Anthropology, History, Economics, and Political Science. Human-Environment Geography: Human-Environment Geography brings together the concerns of Physical and Human Geography. Human-environment geographers are interested in how human societies alter their natural environment, and how they adapt to it. A human-environment geographer might study the effect of industrialized agriculture on climate change, or how residents of coastal Sri Lanka cope with tsunamis. Mapping Sciences: If geographers are asking "where?" questions, one of their most powerful tools will be the map. The Mapping Sciences thus cut across the other three fields. Geographers who specialize in this area develop new techniques for accurately and persuasively representing information through maps. A major component of the mapping sciences is Geographic Information Systems, or GIS. GIS enables its users to analyze spatial information through such operations as finding the overlaps among different phenomena (e.g. are toxic waste dumps more likely to be found in communities of color?) or calculating the spatial outcome of a model (e.g. attempting to predict where deforestation will occur). This book will focus on Human Geography, as well as the parts of Human-Environment Geography that overlap with Human Geography. We will not spend much time talking about the Mapping Sciences as such, but you will see maps employed extensively throughout the text to demonstrate and illustrate important points. Gritzner, Charles F. 2002. Defining geography: What is where, why there, and why care? Journal of Geography 101 (1): 38-40.